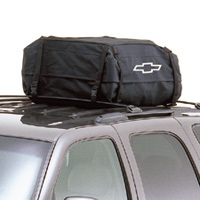 The soft-sided luggage carrier easily attaches to the cross rails of your roof rack. It opens from two sides with double-pull zippers that can be locked for extra security. The carrier`s durable, black PVC-supported polyester fabric with sealed, water-resistant seams will protect your cargo. Not for use on vehicles with altered roof lines.